Knowing how to interpret chord diagrams and being able to read banjo tablature, the written form of music for the banjo, will pave the way for a much smoother road ahead on all of your banjo adventures. Becoming familiar with the most important chords and essential right-hand techniques will put you in the fast lane for having more fun playing music with others. Whether you’re accompanying others or blazing through a fiery banjo solo, you need to know where chords are located on your banjo’s fingerboard. Here are 12 chords you’ll put to good use in thousands of bluegrass and old-time songs. Tablature is the written form of music for the banjo. While it looks much like conventional music, tablature provides banjo-specific information, such as what string you play and whether the string is open or fretted. The five horizontal lines represent the five strings of your banjo, with the top line corresponding to the 1st string and the bottom representing the 5th string. 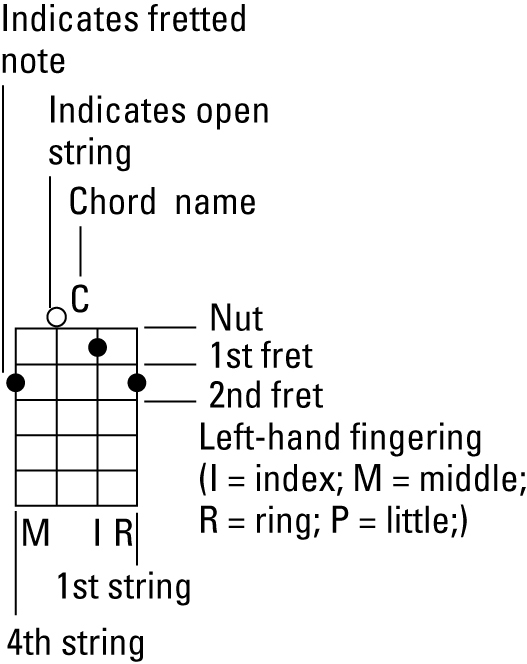 The numbers indicate left-hand fretting positions, with 0 standing for an open string. The key to becoming a great banjo player is having solid timing and rhythm in your picking hand. One of the best ways to develop this ability is to practice the most frequently used patterns in clawhammer and bluegrass style, playing them over and over again until you’ve completely internalized them. Here are the crucial right-hand moves you’ll use just about every time you pick your banjo.